Mr. Bill Chopp, Superintendent for the Brant/Haldimand/Norfolk Catholic District School Board thought that 500 bedkits was going to be a challenging goal to reach, but he brought this objective before his thirty-seven Elementary schools. He knew that it was important that the students learn that there were needy children in developing countries who lacked very basic necessities that we take for granted in Canada. He became aware of the work of the charity called SLEEPING CHILDREN AROUND THE WORLD and he became passionate about the need for the children in his schools to have the opportunity to reach out and touch the hearts of those who, through no fault of their own, lived in extreme poverty. His schools opened their hearts in a manner that far exceeded his dreams. On the evening of April 22nd, there will be a celebration at the Catholic Education Centre at 322 Fairview Dr. in Brantford to announce that the Elementary schools and Board office staff have raised over $48,000.00 in support of SLEEPING CHILDREN AROUND THE WORLD. SLEEPING CHILDREN AROUND THE WORLD is an exemplary Canadian Charity that was founded in 1970 by Murray and Margaret Dryden, parents of hockey legends Ken and Dave Dryden. This Charity has been recognized by the Toronto Star as one of the five best in Canada. This is largely due to the fact that every penny of a donation is invested in a bedkit that is given to a needy child in a developing country. The bedkit contains items that will provide children with a safe and peaceful night’s sleep. Since 1970 this Charity has delivered 923,000 bedkits to the neediest children in 32 different developing countries. A bedkit, provided through a $30.00 donation typically contains a mosquito net, mattress, blanket, bed sheets, shorts, t-shirt, towel, basin and sandals. The message of this Charity has been embraced by the children, parents and staff of the schools in this Board. 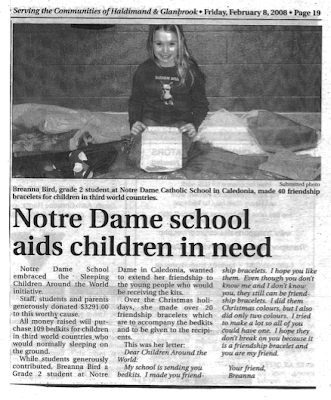 A grade two student, Breanna Bird from Notre Dame School in Caledonia added her personal touch to her donation. She made twenty friendship bracelets and wrote the following message: “I made you friendship bracelets. I hope you like them. Even though you don’t know me and I don’t know you, they can still be friendship bracelets. I hope they don’t break on you because it is a friendship bracelet and you are my friend”. The children from these communities are truly making a difference. Through their efforts over 1600 needy children in extreme poverty will experience something for the very first time – A PEACEFUL NIGHT’S SLEEP ON THEIR VERY OWN MATTRESS UNDER THE SAFETY OF A MOSQUITO NET! Volunteering does not come cheap. My fee was about $2,400 US with some discounts. This covers accommodation, meals (including the weekend you are not actually working) and ground transportation. Our home away from home was Hostal Torreblanca, a charming three-star in a safe area. We dined as a group, experiencing wonderful restaurants. The weekend allows time to sightsee; some volunteers went to Machu Picchu during those two days. We stayed on another two weeks, flying to Cuzco, taking the train to Machu Picchu, busing to Lake Titicaca and flying back to Lima. It all worked well. For information: www.globalvolunteers.org; 1-800-487-1074. Of the amount each volunteer pays, 15 per cent is for general administration and 86 per cent goes toward ensuring the "quality of the program." Bud Philbrook, CEO and co-founder of Global Volunteers, says this amount is directed towards everything from marketing costs to coordinating the volunteer program. "Our goal with respect to finances is to keep our costs as low as possible. The lower our costs the more people can volunteer. Some years we produce a small reserve and some years we are in the red. We play it very close." The Minnesota-based organization has a worldwide staff of 70. About three per cent of their volunteers are from Canada but they hope to increase this. They are working with Merit Travel in Toronto. (www.globalvolunteerscanada.ca; 1-866-202-1622). Founded in 1976, there are now branches in 90 countries. Volunteers build homes for the unsheltered in Canadian communities or, under the Global Village Program, in world destinations. Trip costs are in the $1,200 to $2,000 Cdn range, plus your airfare. Charitable donation receipts are issued. The Canadian University Service Overseas began in 1961. Its projects are Canadian and worldwide, sending technical and professional assistance for stints of up to two years. It is funded by the Canadian International Development Agency (CIDA) as well as donations. Business and professional people can share their expertise in some 600 places in 16 countries. Trips are two to six weeks duration and expenses are paid by CESO or the client or government at the location. Founded in the 1970s by the father of Ken Dryden (MP and hockey great), this non-profit supplies bed kits to street kids in third world countries. Volunteers pay travel expenses and tax receipts are not available. This charity that supports literacy began when B.C. teacher Anne Pearson visited African schools and villages in 1990. Today, volunteers donate time and money to a program that supplies boxes of African-published books to schools. Tax receipts are available. Volunteers work along with scientists and other experts on environmental research and educational projects. You may count turtles, band penguins or assist in needy communities in 50 countries. Costs vary from $446 to $4,746 US. Roughly 50 per cent of it goes to field costs, 34 per cent to planning and recruitment, and 16 per cent to administration costs. Hoping to give struggling children a better night's sleep, 40 engineering students pulled a bus about seven kilometres Saturday morning, as part of a fundraiser for Sleeping Children Around the World. 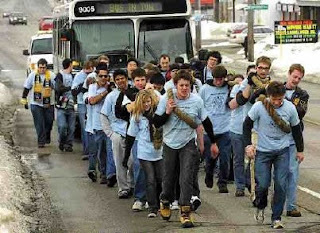 Shouldering heavy ropes looped to the Grand River Transit bus, the students made their way from the University of Waterloo, down King Street to Benton Street in Kitchener. "It gets tiring, especially going downhill because you have to jog," said Laura Sisson, a mechanical engineering student, participating for the second time in the fundraiser called the Bus Push. "Pretty much what they do is buy what is called a bed kit for children in developing nations," said Dave Halford, a vice-president of the society. The kits from the Toronto-based charity (www.scaw.org) include bedding, school supplies and, depending on the region, a mosquito net. After the event, we received the following information from Dave Halford: "I just got all of the money together from bus push and we were able to raise about $1970 for SCAW." Thanks to the students from 66 children who will receive bedkits in the coming months. Despite the less than ideal conditions, Paul and Daphne Might, representing Sleeping Children Around the World (www.scaw.org), visited St. Jude's Church on Sunday, Feb. 17. SCAW provides bed kits for needy children in developing countries. Each kit contains: a small matress and pillow, a sheet, a blanket, clothing, a towel, school supplies and other locally needed items, such as mosquito nets and nail clippers. St. Jude's Sunday School and congregation raised $1,200 plus an anonymous gift from the Brantford Community of $400 donated after seeing the previous article in The Expositor. This total of $1,600 will provide 40 kits for less fortunate children somewhere in the undeveloped countries of our world. Judy Dryden of Victoria got her first real look at extreme poverty last October while travelling in Bangladesh. "It was difficult to see," she admitted. "The need there is huge." But it was poverty that brought her to the tiny South Asian country to begin with, travelling with five other Canadians on behalf of the Toronto-based charity, Sleeping Children Around the World. Their mission was to distribute 7,500 bedkits to some of the country's neediest children. Funded through donations raised back home, each kit contained a few small comforts, including a mattress, pillow, sheets, a towel, and flip-flops. But to the children receiving the gift, nothing could be finer. "All of a sudden you'd get this huge smile and this look of, Is this really mine?'" Dryden recalled of the response. "Most of these children," she said, "have never received anything in their lives." 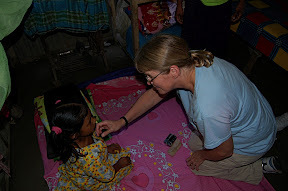 The trip to Bangladesh marked the first overseas volunteer experience for the 56-year-old retired public health nurse. It won't be her last. "I came away with a very positive feeling, like we were making a difference, " she said. Of course, you don't have to leave home in order to positively contribute to life in the developing world. There are, literally, hundreds of charities and non-profit organizations operating in British Columbia, all of them in need of your support. 1. Buy coffee that is fair-trade certified. What good does it do? The fair-trade symbol, certified through TransFair Canada, means the java in your cup or the beans in your cupboard have been produced under safe work conditions and that the farmer has received a fair wage, proportionate to the profit. Why is it important? The coffee bean is the one of the world's most-traded commodities after oil, reaping huge profits margins of between 17 and 25 per cent. Yet, with a handful of large companies controlling the world coffee market, the overwhelming majority of coffee farmers and plantation workers live in poverty and famine. Fair-trade sales currently represent less than one per cent of the global total, said Anil Hira, political science professor at Simon Fraser University. But consumers have the opportunity to boost those statistics simply by demanding the product. "Corporations are very sensitive to these kinds of campaigns. It's essentially why Starbucks adapted to one line of fair-trade coffee," Hira said, adding, "It's one step forward." The hope is, said Hira, "that fair trade can raise the income of enough farmers that their kids can get enough education to move on to something else." 2. Break bread for Afghan women. What good does it do? Supported by the Calgary-based charity, Canadian Women for Women in Afghanistan (CW4WA), Breaking Bread for Women in Afghanistan is a volunteer fundraising project to support education for Afghan women and girls by holding potluck dinners across Canada. The goal of each dinner is to raise $750, the approximate cost of one teacher's salary for a year in Afghanistan (based on 2002 estimates). This organization promises that 100 per cent of funds donated will be forwarded to support teachers' salaries in Afghanistan. Why is it important? Since the project was initiated four years ago, more than 610 breaking-bread dinners have been held in Canada, raising about $800, 000. In total, the schools offer education to more than 1,200 children, some of whom are orphans living on the streets, and all live in poverty. According to Janis Rapchuk, schools supported by CW4WA strive to educate children not only in subjects of reading, writing, math, science, and computers, but also in human rights. "It's the only way for the girls to realize they do have rights," Rapchuk said. CW4WA has 14 chapters across Canada, including one in Vancouver and one on Saltspring Island. How do I get involved? www.w4wafghan.ca. 3. Give a kid a good night's sleep. What good does it do? The Toronto-based non-profit Sleeping Children Around the World hand delivers bedkits and essential personal items to the world's neediest children - many of whom would otherwise be sleeping in the dirt. The charity promises that 100 per cent of each $30 donation goes directly to a child in need, buying him or her a mattress, pillow, sheet, blanket, mosquito net, clothes, towel, sandals and even school supplies. Why is it important? Malaria is one of the leading causes of death in children in developing countries. The situation is particularly critical in sub- Saharan Africa, where the disease, carried by mosquitoes, claims about one million lives - overwhelmingly young children - every year. Simply by providing a treated mosquito net, clothing, blankets and sheets, a sleeping child can be protected from malaria. The child's comfort is an added bonus. Since its founding by Murray and Margaret Dryden (parents of hockey's Dave and Ken Dryden) in 1970, volunteers with Sleeping Children - paying their own way - have personally delivered 926, 350 bedkits to children in 32 countries. How do I get involved? www.scaw.org. 4. Write a letter to end human rights abuses. What good does it do? Thousands of men, women and children worldwide are unfairly imprisoned, kidnapped, tortured, killed or simply go missing every year because of political, cultural or religious beliefs. Amnesty International's letter-writing campaign works to put pressure on the governments, armed political groups, companies and others to prevent and stop these human rights violations, abolish the death penalty and bring to justice those responsible for the abuses. Why is it important? According to John Tackaberry with Amnesty International Canada, the reason to get involved is simple: "You are being the living embodiment of the importance of rights for all." In Canada, there are currently 350 "urgent action" Amnesty campaigns underway, with volunteer chapters operating across the country, including several in Vancouver and around the province. Tackaberry said Amnesty sees positive results - measured as a specific, positive change in the human rights situation - in about 33 per cent of its cases. "There are thousands of people who have benefited from Amnesty International's ability to intervene and write on their behalf," he said. "It does work." 5. Start your own charity. What good does it do? Givemeaning.com makes it easy to set up fundraising pages for walks, runs, head-shaving or whatever else you can dream up on behalf of charities, non-profits and grassroots projects. Founded in 2004, givemeaning. com has provided free online fundraising pages to over 1,200 different initiatives around the world, including several dedicated to causes right here in British Columbia. Why is it important? "I think everybody cares about something," said Tom Williams, the Vancouver entrepreneur behind the website. "Whether your cause is something that is not celebrated by the masses, or something as broad as HIV, we all have something that tugs at our heartstrings. But we don't think that our small, individual contribution will make a difference." Williams said he created givemeaning.com in order to pool those small contributions so that they add up to be something great. To date, the website has helped to raise over $2 million on behalf of 1,500 global and local campaigns. "This is the only organization I know of that allows for grassroots philanthrophy anywhere in the world on behalf of any benevolent issue, from saving abused donkeys to building a school in Africa," said Williams. 6. Publish a children's book. What good does it do? With a strong fundraising chapter in Vancouver, the mission of San Francisco-based non-profit Room to Read is to raise communities in the developing world out of poverty by raising global literacy rates. Public donations allow the charity to work with local authors and illustrators around the world to create unique and culturally relevant children's stories in local languages. To date, about 1.7 million children have been impacted by the charity with books published in 16 different languages. Why is it important? When Room to Read first went into Cambodia in the early 2000s, it found a country devoid of children's books, in any language. Government oppression in the 1970s had left schools destroyed and literally "decimated" the educated population, said Cindy Lang, Room to Read spokeswoman. Children's books, she said, "weren't even on the radar screen." Since then, the charity has rebuilt schools and libraries and published several children's titles in the local Khmer language. Lang said the payback for all the hard work comes when a child receives his or her first book. "It's like the most valuable thing these kids have ever seen," she said. 7. Make a refugee family feel at home. What good does it do? Every year about 40,000 newcomers arrive in British Columbia. About five per cent of those new arrivals have come from refugee camps around the world, arriving in Canada with nothing but the shirts on their backs. As a Friendship Host with the Immigrant Services Society of B.C., volunteers are paired with refugee families and individuals to help ease them through the difficult and often extremely stressful task of resettling into a brand new country. Why is it important? "Just imagine taking yourself out of refugee camp after one or two decades and landing somewhere in the Metro Vancouver area," said Chris Friesen, ISS director of settlement services. Many people, he said, find the change completely overwhelming. Language barriers make success in work and school immediately challenging. Public transit, libraries, community centres can be unfamiliar, while rights we take for granted - such as voting - can be completely foreign. Without help, many can feel depressed, lonely and frightened. In that way, the Friendship Host program is "a life-changing experience," said Friesen. "You are lending a hand to someone who is in immediate need," he said. Of course, it's not just the refugee families who benefit from the program. Host volunteers are also positively impacted through the connection. The impact, Friesen said, is difficult to measure in monetary terms. "But," he added, "in emotional terms, it is significant." Marlee Ritchie is continuing to learn that international care-giving can be "eye-opening, emotional and enriching." Ritchie twice saw the ravages of a war-torn Sierra Leone in 2004 and 2005 while representing Sewing Seeds International on projects designed to help widows regain their place in society. 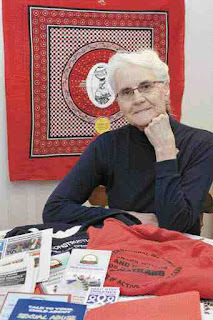 Then later in 2005, she delivered bed kits and supplies to Bangladesh on behalf of Sleeping Children Around The World. Just recently, Ritchie completed a three-week swing as a Canadian delegate, and member of Saskatoon's Grandmothers4Grandmothers (G4G), on a trip to Uganda, South Africa and Swaziland, sponsored by the Stephen Lewis Foundation. Ritchie admits she was "searching for something" after retiring as a psychiatric nurse in 1994 and then caring for her husband, Peter, through an extended illness until he died in 2003. "I was visiting in Alberta when I heard, quite accidentally, about Sewing Seeds International and I thought I could help," says Ritchie. "A dozen of us went for six weeks to Freetown where the devastation of the war in the area was unbelievable and refugee camps were much in evidence. We worked with the widows, who lost their husbands in a civil war which lasted from 1992 to 2002. Many had no means of survival, no support systems, no money to access health care, medications or pay for their children to go to school. We'd go into a community and there'd be long lineups at the door, women looking for simple things like Tylenol, assistance for their children, everyday needs or in some cases, money to bury their dead. "I went back a second time, trying to help women develop their own businesses. The people were settled down, calmer, and they were thankful that we from outside their country were so caring. I don't know if anyone ever fully recovers from the atrocities of war." Then after working on the Bangladesh project, Ritchie found another source of inspiration right in Saskatoon. "I heard about Grandmothers4Grandmothers, went to a garage sale where I met Sharon Maher, and I was hooked. It was like a window of opportunity that I knew ultimately would take me back to Africa. I can't think of a group of people who are so passionate or projects which are so satisfying. It was important to me that G4G contributes funds to the Lewis foundation which aims to ease the pain of HIV-AIDS in Africa. "My first task was organizing the collection of supplies to assist Nutana Collegiate students in filling and packing a SaskTel container going to Tanzania. The response was overwhelming and we helped send clothes, eye glasses, medication, medical supplies, craft supplies, books, desks and bicycles." Hearing the Lewis foundation was going to send a dozen grandmothers to Africa in 2008, she applied, along with 50 others, and was accepted. The grandmothers were required to raise funds or find aeroplan miles to cover the trip. Ritchie's first stop was at Jinja, Uganda, where they met those involved with the Phoebe Education Fund for AIDS orphans and vulnerable children. "The PEFO organization is led by two brothers, who lost their parents to AIDS, and they wanted to make a difference for others. We went into villages, met grandmothers, many of whom were struggling to raise up to 16 children on an old age allowance of about $14 a month. We toured a school where there were 153 students in one room and each had just one scribbler and just one pencil. The grandmothers struggle with the costs. The little children are alert, they really want to learn and they all know education is the key. "The grandmothers put on displays of dancing, singing and drumming, shared their ceremonies, traditions and stories freely with us." The next visit was to the Thembalethu, a home-based AIDS unit in the Nkomazi region of South Africa. "The charge person is a dynamic nurse who has 18 orphans living with her and has lost track of how many she nurtured over the years. The grandmothers were so grateful for our presence and couldn't believe we would come from so far away just to give them a hug. " On March 8, all the Canadians joined in an International Women's Day celebration in Manbzini, Swaziland. She says each stop emphasized the need to get "more resources to the women, the children and the AIDS orphans, and try to bring them hope. There's a saying within the Lewis foundation that we aren't going to rest until the grandmothers in Africa can rest. We want them to have the food, water, the mattresses and the comfort they deserve." Ritchie will now undertake a series of speaking engagements, first with the dozen G4G groups in the province and with any other organizations willing to listen.